"Hi there. 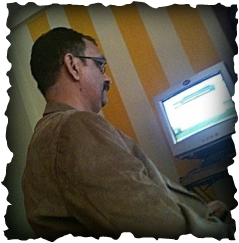 That's me, Sorab Ghaswalla, Founder of New Age Content Services. .....& an Internet Entrepreneur & Digital World consultant. I love challenges. So, I am constantly pushing the envelope. That's the reason why I am always immersing myself in new technology. Having seen the intricacies of the Web, up, close and personal, I turned its votary 14 years ago. My faith remains unshakable. Believe me, the Internet is no bubble. Because of my near three-decades' long experience, I am intimate with the words, Data, Information and Knowledge. Information no longer remains the privilege of a few. What does it really take to get Information these days? A hand-held device plugged into the Net, right? But Knowledge, ah, now that's a different game. Knowledge empowers people to make informed decisions. Let me explain this, very quickly. If 3 and 2 bucks represent Data, by adding them you get 5, which is Information. But were your brain made to understand, or if it did already know, that the result of these two subsets, 3,2, could fetch you a quick drink to quench your thirst, that would be Knowledge. That's why I have floated New Age... To empower our clients with Knowledge born out of Data & Information. Knowledge, which will then allow them to make the right decisions in their respective fields. To ensure that Knowledge reaches our clients fast, New Age Content has plugged into the Internet. To deliver our services in a quick and cost-effective manner. Simultaneously leveraging on the positives of the Web's in-built components. The services that the tabs on the left hand side of this Page represent are mere means to an end. New Age Content Services is a Mumbai, India-based registered Limited Liability Partnership (LLP) firm with a global outlook and a growing list of national and international clients.